LAS VEGAS - Aug. 23, 2018 - PRLog -- Despite efforts across the country the number of homeless and/or displaced veterans and homelessness in general continues to increase nationwide. Veterans Village Las Vegas has developed a replicable system to build sustainable housing and master plan neighborhoods in Las Vegas and communities in the United States. • Proposed 250-unit special needs housing complex with a hydroponic garden, 6000 sq. ft, multi-use building which is all part on the "Main Street" concept tying this 7-acre master plan together. 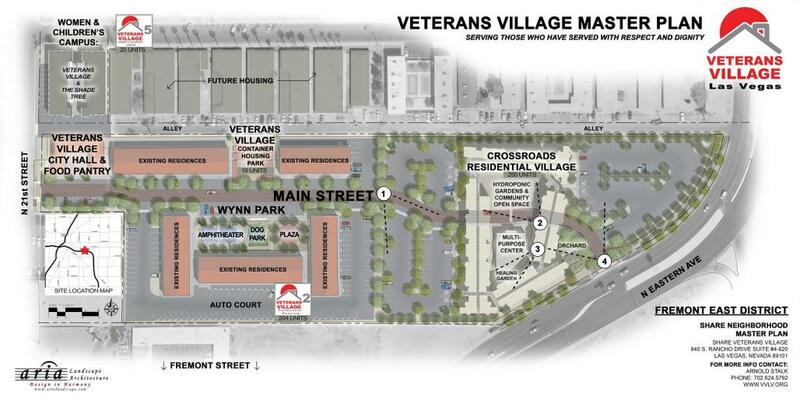 This master plan in town/downtown will help end US Veteran homelessness in Southern Nevada and serve as a model for replication across the USA. "As citizens we have a responsibility to help ALL those who served. It is unacceptable to have our United States Veterans and their families living on the street. I am proud to lead the Las Vegas community to provide affordable housing and resources allow our Veterans to transition back to a life of dignity with the respect they deserve," Dr. Arnold Stalk, Founder Veterans Village, Las Vegas.